Un software de seguridad que protege los PC de malware y virus. SecureAPlus es un software de seguridad que protege los PC de malware y virus con su potente pero fácil de usar listas blancas de aplicaciones, y las tasas de detección fiable de más de 10 nube motores anti-virus con Universal AV. Se aprovecha la potencia de la nube permitiendo bajos recursos utilizados y la compatibilidad con otras aplicaciones anti-virus y anti-malware instalados por lo que es la actualización de seguridad perfecta para cualquier PC con Windows. Please note: The program includes a 2-Year Premium License. Good modern antivirus and malware, better for intermediate or advanced users. Not a Premium License, it's just a code for a so called "Freemium"... There must be some difference. I've checked this AV the last time it was given here, and I like it very much. The idea to use several cloud antivirus programs is very good. You have something like Virustotal, but without limitation of the size of the files, and with the automatic checking of all the files on your PC. There is a drawback however. Each time a single cloud antivirus detects a malware, you have a warning, even when it is almost sure that it's a false positive. For that reason, the program may be a bit tedious to use at the beginning. But it is a really great supplement to your regular antivirus. TK, very insightful points there and we appreciate the feedback. For files that are unknown to UAV, users have the option to upload it for further scanning, similar to how users can upload the full file to VirusTotal. It simply uses hashes initially to avoid unnecessary strain on the internet connection rather than opting to send every file (known or unknown) to our servers for further scanning. But great feedback nonetheless and we hope that you consider using it and see the benefits it delivers in the long run with application whitelisting. The software froze just after the initial install. I can't see that it clashed with any other software on my Win 7 Pro computer. I rebooted and attempted to change some settings, including postponing/pausing the initial scan, it froze again. I rebooted in safe mode and had the same issue. It doesn't appear to like something on my computer and I don't have a whole day to play around with it. I tried to uninstall it using Revo which started the uninstall process but achieved nothing after 30 mins. I then tried Soft Organizer which after 45 mins said it had uninstalled and removed any leftover program traces. On reboot I found that SecureAPlus was still installed! I'm sure this works on some other computers, there are too many good recommendations online for that to be the case. Could I have the +4 Hrs that I've lost due to this hassle back please?! The software froze just after the initial install. I can't see that it clashed with any other software on my Win 7 Pro computer. I rebooted and attempted to change some settings, including postponing/pausing the initial scan, it froze again. I rebooted in safe mode and had the same issue. It doesn't appear to like something on my computer and I don't have a whole day to play around with it. I tried to uninstall it using Revo which started the uninstall process but achieved nothing after 30 mins. I then tried Soft Organizer which after 45 mins said it had uninstalled and removed any leftover program traces. On reboot I found that SecureAPlus was still installed! I reverted to using System Restore as I'd set a restore point before installing SecureAPlus. I actually chose to use a restore point from a couple of days previous. Oddly, after the restore process I find that the SecureAge folder on my C:\ drive that the installation had created still had quite a lot of files in it. By no means all of them - various .conf files, and other files connected with Everything Search and translations etc I'm sure this works on some other computers, there are too many good recommendations online for that to be the case. Could I have the +4 Hrs that I've lost due to this hassle back please?! I think one of the most basic recommendations from security researchers regarding corporate IT, is block everything by default, allowing Windows to only run pre-approved executables [programs], & if needed, pre-approved scripts. And that's what SecureAPlus Premium does. Why doesn't every other security-related app do the same thing? Because most people don't want the best protection -- they want the least intrusive. And they want easy... Many don't want to put up with a long initial scan, as SecureAPlus Premium finds & checks the programs on your Windows device, and most don't want the extra work of choosing which files [executables] to allow. Years ago ZoneAlarm pioneered a firewall that looked in as well as out -- the 1st time an app requested network access you had to approve or deny that permission. Major security software companies followed suit, for a while, but most long ago removed the feature or turned it off by default. The continuing trend for years has been less choice, not more. Maybe put another way, if the original team behind SecureAPlus Premium was led by marketing types, the software most likely would have never been created. Its design priority was/is to do a job -- not make people happy -- and in the process make them extra [if minimal] work. From a purely marketing standpoint, as you can see watching late night TV commercials, that's crazy. 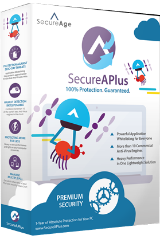 That said, when it comes to security, Nothing is 100% foolproof, & that includes SecureAPlus Premium. It's designed to run alongside more standard antivirus or security software, and you should. You can set policy with Windows to allow only pre-aproved apps/scripts, & someone might get around that simply by renaming their executable file to match something on that list. SecureAPlus Premium looks for signed certificates, which is better, but it's not completely bulletproof... it's been shown that signed files can be altered without effecting their certificate, certificates have been stolen, & there are companies issuing certificates that aren't completely on the up & up. Hopefully heuristic scanning by good security software will catch anything that slips through the cracks. If you Google on SecureAPlus, you'll see that SecureAge Technology reps have been active in security-related forums since the summer of 2013. I'm not naive enough to think that that will allay all of the concerns some people will have when it comes to software & security when the company isn't from the US &/or EU. If you read through some of those threads however it does not seem like a company after a quick buck. I think one of the most basic recommendations from security researchers regarding corporate IT, is block everything by default, allowing Windows to only run pre-approved executables [programs], & if needed, pre-approved scripts. And that's what SecureAPlus Premium does. Why doesn't every other security-related app do the same thing? Because most people don't want the best protection -- they want the least intrusive. And they want easy... Many don't want to put up with a long initial scan, as SecureAPlus Premium finds & checks the programs on your Windows device, and most don't want the extra work of choosing which files [executables] to allow. Years ago ZoneAlarm pioneered a firewall that looked in as well as out -- the 1st time an app requested network access you had to approve or deny that permission. Major security software companies followed suit, for a while, but most long ago removed the feature or turned it off by default. The continuing trend for years has been less choice, not more. Maybe put another way, if the original team behind SecureAPlus Premium was led by marketing types, the software most likely would have never been created. Its design priority was/is to do a job -- not make people happy -- and in the process make them extra [if minimal] work. From a purely marketing standpoint, as you can see watching late night TV commercials, that's crazy. That said, when it comes to security, Nothing is 100% foolproof, & that includes SecureAPlus Premium. It's designed to run alongside more standard antivirus or security software, and you should. You can set policy with Windows to allow only pre-aproved apps/scripts, & someone might get around that simply by renaming their executable file to match something on that list. SecureAPlus Premium looks for signed certificates, which is better, but it's not completely bulletproof... it's been shown that signed files can be altered without effecting their certificate, certificates have been stolen, & there are companies issuing certificates that aren't completely on the up & up. Hopefully heuristic scanning by good security software will catch anything that slips through the cracks. If you Google on SecureAPlus, you'll see that SecureAge Technology reps have been active in security-related forums since the summer of 2013. I'm not naive enough to think that that will allay all of the concerns some people will have when it comes to software & security when the company isn't from the US &/or EU. If you read through some of those threads however it does not seem like a company after a quick buck. A set of energetic and common core compliant math challenges! * Best New Apps & Games! Featured by iTunes in 112 countries Labo Train is a creative game for kids 3-7.